"The best crisp I have ever made! Easily substituted to gluten- and/or dairy-free. Awesome with any fruit combination!" Mix peaches, blackberries, 1/2 cup gluten-free flour, white sugar, lemon juice, and cinnamon together in a bowl; spread evenly into the prepared baking dish. Stir brown sugar, oats, and 3/4 gluten-free flour together in a separate bowl. 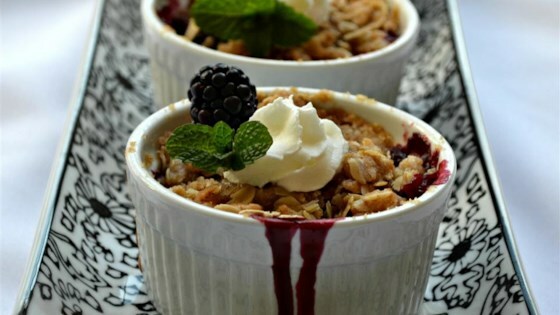 Cut butter into oat mixture until it resembles coarse crumbs; sprinkle evenly over berry mixture. I used blueberries instead and still turned out awesome. Next time I may use more oats. Best crisp I've ever made...thanks! I will make it again! This time I used a combo of blackberries and blueberries. I substituted coconut sugar, which has a similar texture to brown sugar. Absolutely delicious. Kids get to eat the fruit they would normally not ear.